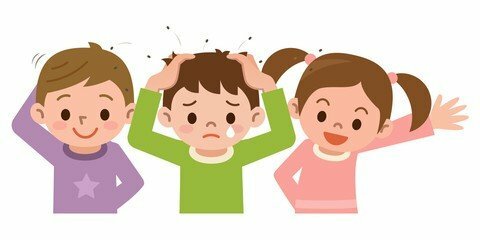 When you have children in school or daycare head lice is a reality. While I’m African American so generally speaking have enough oil in my hair that lice does not attach I do have biracial children and a Caucasian husband so I made it my goal to know a remedy just in case. I found a lot of essential oils were reported to be a good defense against head lice. Oils make it so that the lice can’t latch onto the hair. With this knowledge I figured combine oils into one super-powered lice remedy. When a friend of my son’s did get head lice I mixed up a batch and both the mom and I were pleased with the results. Outside of caring for the hair a important thing to remember is cleaning. If you do have head lice make sure to boil all hair items such as combs or hair clips. Also wash all pillowcases, sheets, and shirts. This will help reduce the chance of reinfection. Disclaimer: I am not a doctor. I have not used this on anyone in my family as of yet but I did make some for a friend and she swears it works. She keeps some on hand for the school year. Saturate the hair with the oil. .Put a shower cap on and let sit for 1-2 hrs. Mix 2 cups of apple cider vinegar with 1 cup of water. Spray the hair and massage thru to the ends. Comb thru the hair and rinse. Apply some coconut oil to the hair and let it stay on. Repeat for 3 days to ensure all the eggs and lice are removed efficiently. This is great to know. I love to use natural remedies whenever possible. Thankfully, we’ve not run into head lice yet, but I’ll know where to come if we do! This is helpful! I will be sure to share with some of my mom friends with school aged kiddos! Natural remedies are always great. I will keep this remedy in mind if I ever have to deal with lice. So far we have been lucky not to have gotten lice. I do put teatree oil in our shampoo and conditioner as a preventative as well as making sure the kids use hair spray or gel when we style their hair in the mornings. What a great natural remedy! I had lice as a child and it was a nightmare. I used to catch them so easily from other kids cause I’ve always had long hair. Hope my daughter never has to go through this!